Plates of multiple plots, each of which can be edited in a manner previously available only for some of the stand-alone diagrams. Moreover, the properties of the whole plate or all its diagrams can be changed simultaneously, e.g. scaling the common x axis or setting to black and white. New function HTMLtableOrdered, which enables to specify the width of the table (number of analyses across the page), as well as a primary and secondary keys for their ordering. 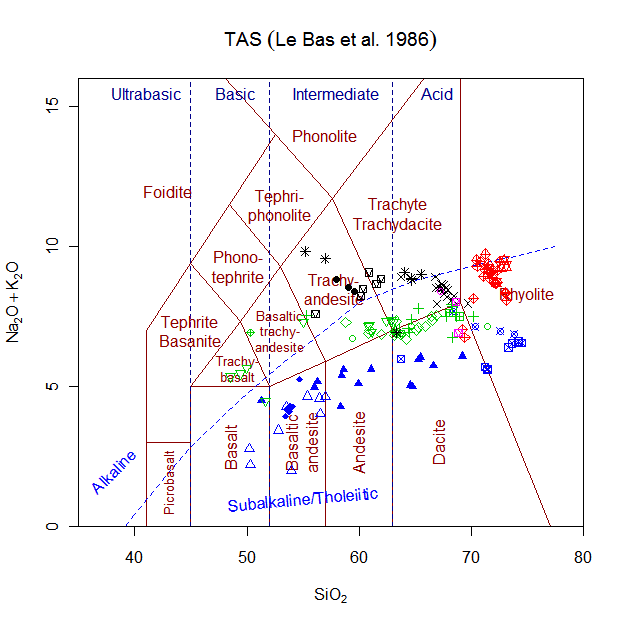 Locales for classification plots (French and Czech translations of field names are provided as examples). Import and export for XLSX files (32bit Windows only). Naming the plotting windows for better orientation (plates require that R is installed as SDI interface, i.e. each plotting window is separate). New are also persistent options that can be modified in a simple GUI and then saved to a configuration file. Upon next start, the GCDkit will e.g. remember the directory with your favourite data. Ternary plot of Na2O-Al2O3-K2O (mol. %) for judging the balance of alumina and the two alkali oxides. Diagram of Sylvester (1989) to distinguish collision-related alkaline granites from calc-alkaline and peraluminous suites. Ternary plot Hf - Rb/30 - Ta*3, proposed by Harris et al. (1986) for classification of collisional granites. Geotectonic diagrams for (ultra-) basic rocks of Verma (2006) based on natural log-transformed ratios of major and minor elements. Geotectonic diagrams for (ultra-) basic rocks of Agrawal (2008) based on natural log-transformed ratios of trace elements. New diagram Zr-Ti of Pearce (1982). New form of spiders, colour-coded according to an independent variable, such as silica contents (spider.contour). Choice of several styles of labelling x axis in spiderplot (e.g., rotated and/or offset labels). 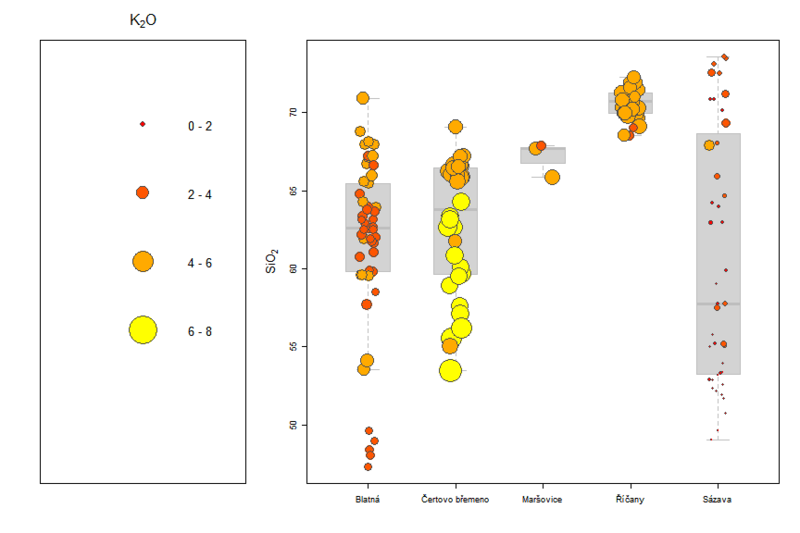 Several new normalization schemes for spiderplots were added, including e.g. PGE. 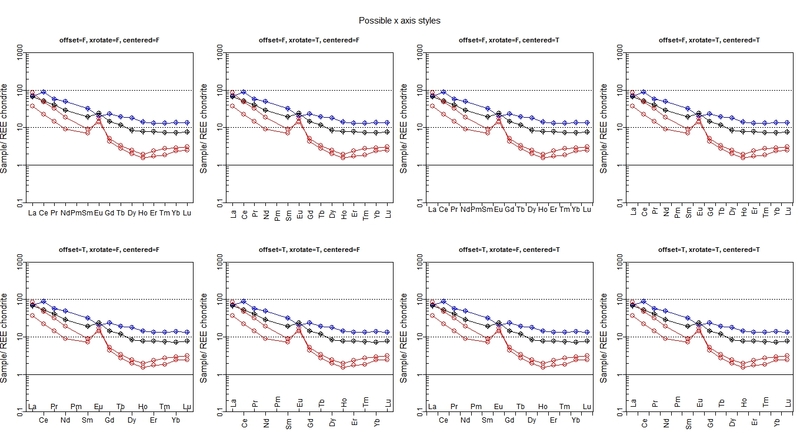 New function to plot so-called stripBoxplots - i.e. stripplots of selected parameter in individual groups, each underlain by a boxplot. Optionally also a second variable can be portrayed by various size of plotted circles. Function summaryRangesbyGroup for printing ranges of selected geochemical parameters in individual groups of analyses. 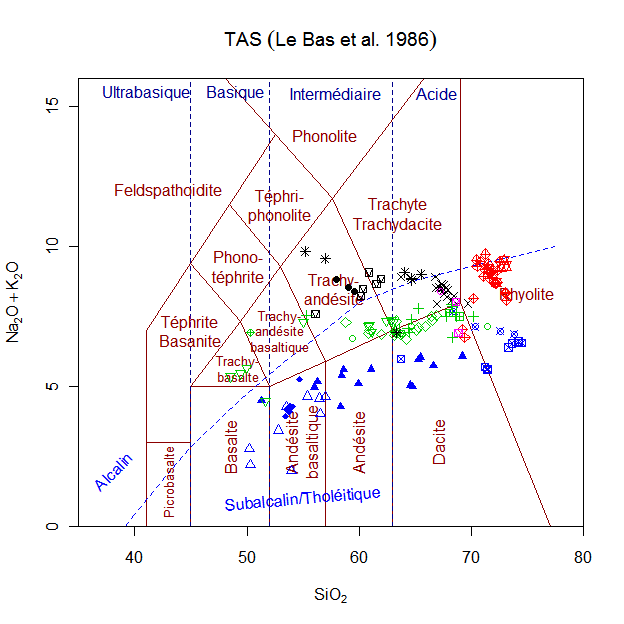 Wedge diagrams and concentration ratio plots (Ague 1994) became an part of the isocon.r plugin to expand the range of tools available for addressing mass balance during open-system processes such as metasomatism, partial melting, migmatitization or metamorphism. JungAlTitemp.r: New plugin implements thermometer of Jung and Pfänder (2007) based on experimentally determined Al2O3/TiO2 ratios in granitic magmas. Help: links to original papers through the DOI system. Much more examples added. See our web page or this short paper for further details. GCDkit version 3.0 released (at last)! We are pleased to announce that the new stable version of GCDkit has been just released! It is a bit ashaming, but it has taken exactly five years to debug some of its revolutionary features. First, the system enables editing plates of multiple plots, in a manner previously available only for some of the stand-alone plots. Second is the internationalization – we have introduced dictionaries, serving for the translation of classification diagrams. Czech and French localizations are provided as an example. Third, we have made some important steps ahead stripping the core of the system of the (M$ Windows-specific) graphical user interface (GUI). Most of the commands can be invoked now in the batch mode, thus further speeding up otherwise tedious processing of large data files. This will ultimately enable writing programs running GCDkit from the command prompt, and potentially also design some alternative GUIs. The new version can load data from Excel 2007 (xlsx) files (32bit systems only!). New are also persistent options (such as directory with your favourite data) , that can be modified in a simple GUI and then saved to a configuration file. Of course, the release addresses the stability issues, improves the appearance of the plots, and brings several new diagrams and plugins.